Well-Struck Devices With Bold Detail. 100% RISK FREE SATISFACTION GUARANTEE. The details on this Gold Eagle are well-preserved, especially in the feathers of the headdress on the obverse. 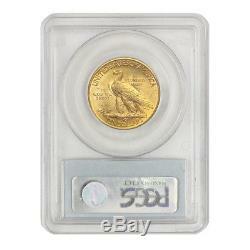 Own this Gold Eagle today! Any comparative pricing and population values were current at the time this listing was created. Pricing and pop values are subject to change. Take your time and check out your merchandise up close and personal and see for yourself that it is everything we say it is! Mint State Gold does not! Love it or send it back! NO hassles, NO excuses, NO delays... PNG membership is an honor and privilege restricted to the world's most highly respected rare coin and precious metal dealers. About the Professional Numismatists Guild (PNG). PNG's Code of Ethics and Standards for membership require that PNG only accept the most ethical professionals as members. Every PNG member MUST adhere to the strict Code of Ethics and Standards set forth by PNG. Admittance to PNG is voted upon by the PNG membership. PNG Collector's Bill of Rights (see below). ICTA serves as the national trade association for all dealers, collectors, and investors. The ANA is the world's largest numismatic organization, with over 30,000 members. Current President of the California Coin and Bullion Merchants Association (CCBMA). Founded Stuppler & Company, Inc. Com's parent company) in 1995. One of the nation's most well known and highly respected coin dealers. 50+ year veteran in the rare coin & precious metal community. PNG Collector's Bill of Rights. To reaffirm PNG's commitment to collectors and the numismatic fraternity, the Professional Numismatists Guild has adopted a Collector's Bill of Rights. This ten-point pledge of consumer protection and education puts extra security into the hands of collectors, letting them know they can do business in the way it should be done --- in a professional manner and with dealers of the highest integrity, who will stand behind the merchandise they sell. For stocks: market cap = number of shares outstanding X price per share. For Rare Coins: market cap = population X price. Population is determined by the number of coins graded by NGC, plus the number of coins graded by PCGS; Price is based on the PCGS current list price. The first step in identifying undervalued coins is comparing the market cap of coins based on the formula above. CoinStats then goes on to compare the decrease in population of the next higher grade, to the increase in price of that grade. Albanese is the founder of CAC, a leading member of the numismatic community, and an authority on coin grading. For quality-conscious collectors, dealers, and investors, a green CAC sticker on an encapsulated coin has significant meaning and CAC coins often command a premium over their contemporary counterparts. Allow 3-5 days to clear. All orders in the continental U. We do our best to accommodate special requests, however, extra charges may apply. We haven't built our business on clients keeping coins they're unhappy with. 410 Woodland Hills, CA 91367. The item "1932 $10 Indian Head PCGS MS64 grade Mint State Philadelphia Gold Eagle coin" is in sale since Wednesday, October 4, 2017. 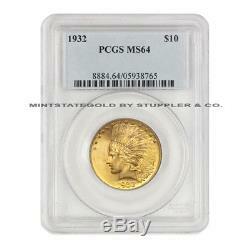 This item is in the category "Coins & Paper Money\Coins\ US\Gold (Pre-1933)\$10, Eagle".